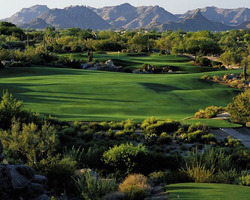 Today's feature is the Boulders Golf Course. This public, resort course highlighted by huge boulder formations was designed by Jay Morrish. Vital Stats: Par 71, five sets of tees ranging from 6,726 to 4,684 yards has a slope rating of 140 from the back tees. There are 75 bunkers and has water which comes into play on three holes. Amenities: Driving range, bunker and chipping areas, practice putting green and a full service restaurant. There's a golf academy headed by Donald Crawley, who is ranked as a top 100 instructor by Golf magazine. Why play here: Both boulders courses (North and South) are well known for their stunning views, with giant boulder formations and rock outcroppings framing the holes. Structures are well hidden providing a pure golf feel. Fairways blend with the natural terrain, and greens are small but true with subtle breaks. Course conditions are immaculate. The South course has been ranked numerous times by national magazines, including the No. 1 ranking by Golf for Women for womens facilities. Golf World Magazine recently came out with its 2009 Readers' Choice Awards Top 50 - Public*Private*Resort. There are two areas I handle for Golf Zoo - Florida and the RTJ Golf Trail in Alabama. I will talk about the Public "Top 10 List", for my area. 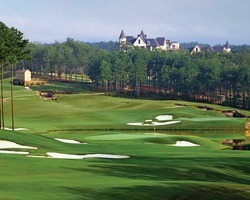 The Robert Trent Jones Golf Trail, two facilities - Grand National (Rank #1), Opelika, Alabama. This facility has two great championship layouts - Lake and Links courses. The other facility is Capitol Hill (Rank #2). Prattville, Alabama. This facility has 3 championship layouts - Judge, Legislator and Senator. Both these facilities have a Marriott property on site, but other lodging options are also available. The next facility on the "Top 10 List" is Orange County National (Rank #8) in Winter Garden, Florida. This facility has 36 holes on site and a fantastic practice facility. Both courses (Panther Lake and Crooked Cat) are host to final stage of PGA Tour final stage of Q'School every two years. There are hotel rooms on property, but there are many options for lodging in Orlando. Here are some other courses in Florida that round out the " Top 50 Public Courses": Southern Dunes (Rank #17), Haines City, Florida. TPC Tampa Bay (Rank #18), Lutz, Florida (Home to Sr. PGA Tour event). Celebration GC (Rank #24), Celebration, Florida. PGA Village (Rank #30) (54 holes), Port St. Lucie, Florida. RTJ Golf Trail at Magnolia Grove (Rank #32) (36 holes), Mobile, Alabama. Now for the some of the " Top 50 Resort Courses" in my area: Walt Disney World Resort (Rank #13) (72 holes and home to PGA Tour event), Lake Buena Vista, Florida. World Golf Village (Rank #15) (36 holes), St. Augustine, Florida. TPC Sawgrass (Rank #21) ( Home to the Players Championship, 5 golf courses to choose from at this facility, must stay on site), Ponte Vedra Beach, Florida. PGA National GC (Rank #42) (Home to PGA Tour Event, 5 golf courses on site, must stay on site), Palm Beach Gardens, Florida. Innisbrook Resort and GC (Rank #45) (Home to PGA Tour Event, 4 course on site, must stay on site), Palm Harbor, Florida. Lely Resort G&CC (Rank #48) (36 holes on site), Naples, Florida. If any of these courses are of interest, please call me at 888.333.6103, or email me at glen@golfzoo.com. As I mentioned; I handle Florida, along with the RTJ Golf Trail in Alabama. I can set up packages for all these areas and we have numerous other courses to choose from, check out www.golfzoo.com and see what we're all about.